The beauty of our CRM integration is that we provide you with a number of ways to send applicants directly into your CRM. You can choose from three methods to forward applicants both into the CRM and related vacancy. You can also forward applicants you wish to keep on file, i.e. those you want to retain in your CRM, but not against the vacancy they applied to. In this article we will will look at all options, starting with forwarding applicants to both the CRM and related vacancy. (Ideal if you don't wish to do any pre-sifting of candidates and retain every single record in your CRM). (Ideal if you want to do an initial sift before adding candidates to your CRM and use our automated communication tools). (Ideal if you want to do some initial pre-screening within idibu before progressing candidates into your CRM, and use our automated communication tools). Want to know more about the benefits and functionality? When we have set up your idibu account and activated the integration with your CRM, we create a new area in your idibu Settings called 'CRM Handoff'. 1. Log into your idibu administration account directly. 2. 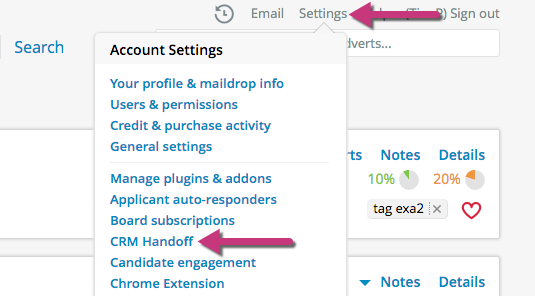 Click 'Settings' in the top right of the screen and select 'CRM handoff' from the drop down list. 3. Scroll down a little and you will see a number of options with tick boxes to the left hand side. You can now select one of the three options discussed at the start of this article. 1. If you want to automatically forward all candidates that arrive in idibu on to your CRM without sifting, then select the tick box next to 'Send all new idibu candidates into the CRM automatically'. This means that your users simply click the green traffic light button to forward a candidate from idibu into the CRM and associated vacancy. 1. Tick the box next to 'Use green traffic light only to send candidates to both CRM and Vacancy'. 1. If you want to use a bespoke ATS status (or one of our default status options) as a trigger to send candidates into your CRM and vacancy, then tick the box next to 'Use a specific ATS status to send candidate to both CRM and Vacancy'. This means that whenever a candidate is moved into this status, their details will be forwarded to the CRM and vacancy. 2. A drop down list will appear displaying the ATS statuses you currently have active on your account. Simply select the ATS status you wish to allocate as your 'trigger' to forward the candidate details into your CRM. In the example below, we have created a status called 'Send to CRM' (Feel free to push the boundaries in terms of originality). Remember, these statuses can be configured however you like so there's no need to just choose from the default list - see 'Editing and customising the ATS status list' in this article. For more information on how your users will work with selective forwarding, take a look at 'Option 3 - Using a specific ATS status as the sending trigger' in this article. Forwarding applicants you wish to 'keep on file'. We understand that quite often an applicant will apply to your vacancy who isn't quite the right fit, but who you feel you could help with another opportunity now or in the future. For this reason we built a 'keep on file' workflow into our traffic light system. i. Automatically moved to the 'Keep on file' status in the idibu ATS. ii. Retained in the idibu Talent Bank so they can be found in future. iii. Sent the custom autoresponder message you have created for this scenario (if you are using autoresponders). However, you can also forward these candidates into your CRM without them being logged against the vacancy they applied to. This allows you to retain the candidate in your CRM talent bank and manage them as you wish from there. 1. Access the CRM Handoff area as outlined above.